I've seen homemade foam stamps everywhere lately... so we had to jump on the bandwagon, right? I hate buying stamps (with a passion) because they are expensive and I'm OCD about them getting totally destroyed, so these homemade stamps were the perfect idea for us. I wasn't too bright the first time around and tried using abc letters... hmmm... guess who was totally confused when all the letters were BACKWARDS? Yep! I'm not so bright sometimes. I feel like I've done that sort of thing so many times that you'd think I'd learn by now... but no! Anyways, these are quick. Stick foam stickers to the bottom of the play-doh containers. I put two stickers on top of each other to make the stamp a little higher. It seemed to leave a better print. Then, instead of using stamp pads... we painted directly onto the stamps with the Do-A-Dot Markers. I liked this instead of stamp pads because it was a lot cleaner and made sure we got less ink around the edges of the play-doh containers... which in turn made it so that the stamps printed cleaner. We totally just got super cheapo foam stickers in the Target $1 aisle. I'm going to make a set for each holiday and theme that we do this year. This is a great way to use up some of the leftover foam stickers I always seem to have after holidays! I also liked that when we were stamping, I could push my fingers down inside the center of the play-doh containers to make the print be a little bit more even. I'm sure I've missed some... so if you've made a homemade stamp, definitely pass it along so I can check it out! oh my! this is such an awesome idea!!! 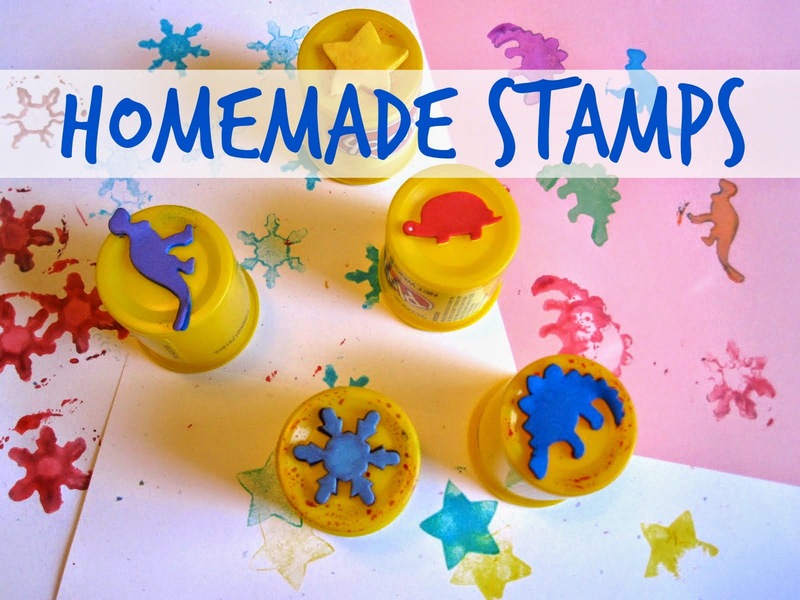 my kiddies loved stamping and this is such an easy diy thing. i love it! What a great way to reuse Playdough containers! They would really give JDaniel something to grip! Great idea! We'll have to try it! BTW, regarding the dry playdoh, we had some that was not completely rock-hard, so we actually just used plain old water to revive it. It is a bit messy at first to work it into all the clumps, but it did the trick okay enough.